It’s exactly two months since I left home and I am sorry for the lack of input over the past few weeks. 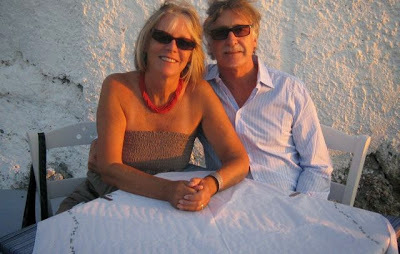 After our visit to the UK we took ourselves off to travel round Greece for a month (it was our 40th wedding anniversary – I really don’t know where all those years have gone?) 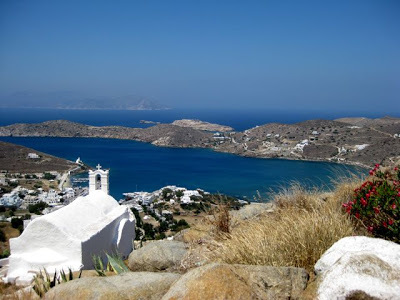 – Crete, Ios, Sifnos, Syros and Athens (all wonderful!) – and are finally home to a damp, chilly and wintery Mullumbimby evening. The homecoming was not too bad: we arrived, miraculously, with our luggage and all in one piece There were beautiful notes and pictures from our grandchildren to greet us plus a big bag of citrus from my friend’s garden. (I won’t talk about the box of mail – mostly the kind you don’t want in window-face envelopes). A quick inspection of the garden, in the dark with a torch, made me happy – there has obviously been a lot of rain, it was flourishing and I was able to pick enough veggies to make a quick curry. Ios – from the top! 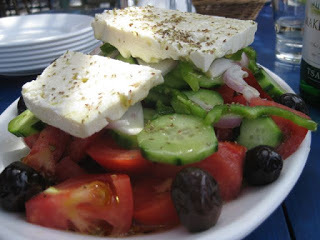 The staple of every Greek meal is a salad consisting of tomatoes, cucumber, olives and feta cheese – dressed with dried oregano/thyme, olive oil and salt – Greek Salad. 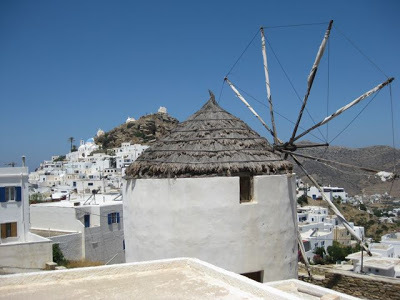 Optional extras are; thinly sliced red onion, capers, sliced green capsicum, braised fennel, chunks of toasted barley bread(Crete), soft cheese(Sifnos) – and there must be dozens more variations that I haven’t tried yet. 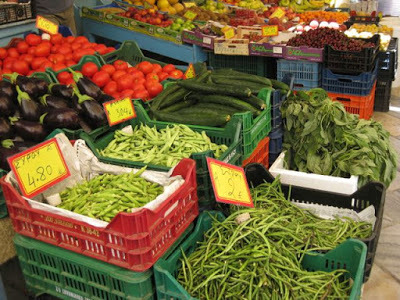 If this sounds boring – it is not because the produce is fresh and has texture and flavour. I asked my husband why he liked this salad too and he said ‘because it’s satisfying – when you eat a tomato in Greece, it’s like eating a mango – and the cheese makes it hearty – a meal in itself’. 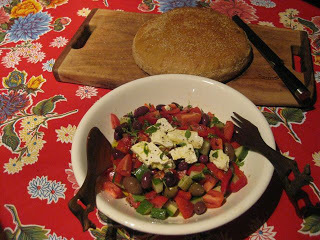 The trick to making a good Greek Salad – and believe me I have had plenty of bad ones outside Greece – is to make it with the best and freshest produce you can – that also goes for the olive oil and the olives. Tomatoes – use ripe, but firm ones and cut into bite size chunks. 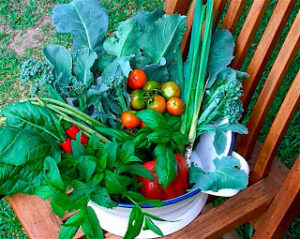 Fresh from the garden is best. Cucumber – the small, thin Lebanese variety with either the skin peeled or scored so that it will hold the dressing. No big, flabby ones please that are all seed. Cut into chunky halved circles. Olive oil – extra virgin and fresh – not something pale yellow that has been sitting on the bench top in a clear glass bottle for ages or, heaven forbid, a plastic bottle. Put a slab of feta lastly on the top (not chopped up in the salad!) and drizzle the oil over the top of this and sprinkle with the dried herbs and sea salt. Serve with fresh strong bread – essential for mopping up the salad juices. 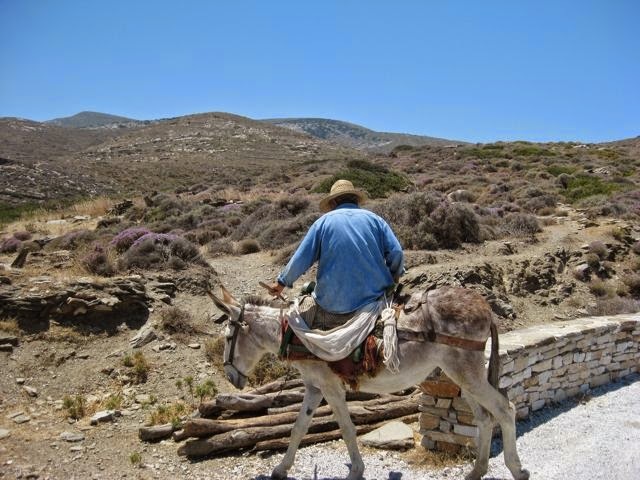 See previous posts on slow-bread making and Greek baked beans (gigantes) for a complete meal. Yamas! Our 40th wedding anniversary on Ios – not a bad place to be! Everyone talks about Ios being a mad party island, but if you go early or late in the season,you can have a wonderful time – we did!.